Invites are an easy way to make people aware of your event. Not only do they alert potentially interested parties to your happening but they also provide a very direct way to get in front of them. While events may pop up when shared in the Facebook News Feed, invites go directly to the addressed party and show up in their Facebook notifications. Sending invites is the best way to get your event noticed, but there are some limitations marketers need to be aware of. Pages are allowed to send invites but they’re limited to just 50, while individuals can send up to 500. This limitation makes sense, as we wouldn’t want Pages spamming all of us with countless invites and being invited by a friend, rather than a Page, makes us far more likely to check out and attend an event. With this 50 invite limit in mind, we must look at the best way to make use of those invites we’re given. To receive the greatest return, target your best influencers. These are people that are relevant to your event and most likely to share it with their own audience. It’s important to be sure that these influencers aren’t just people with countless connections but those with connections that are part the relevant audience you wish to reach. Having an established relationship with influencers can help spread the word about events by getting them seen by a far greater number of potentially interested parties than just the 50 invites your Page is limited to. Before sharing events with influencers, it may be valuable to reach out to them directly, give them additional information about your event, and let them know you’d appreciate if they shared it with their own audience. If you ensure your influencers own audience is in-line with your event, they should be happy to share it and help to increase interest in attending. Once you’ve harnessed your influencers with the Page invites, you can use your own pool of 500 personal invites to further reach interested connections. Be sure that you’re inviting those friends who are relevant to your event. Your aunt Connie who works in finance for a paper company and likes country music isn’t likely to care about a your death metal festival, and those who often receive irrelevant event invites will likely tune them out in the future. People overwhelmed by uninteresting event invites are likely to shut our all invites, hurting not just you but all other Pages promoting their happenings in the future, so be selective of who you send them to. 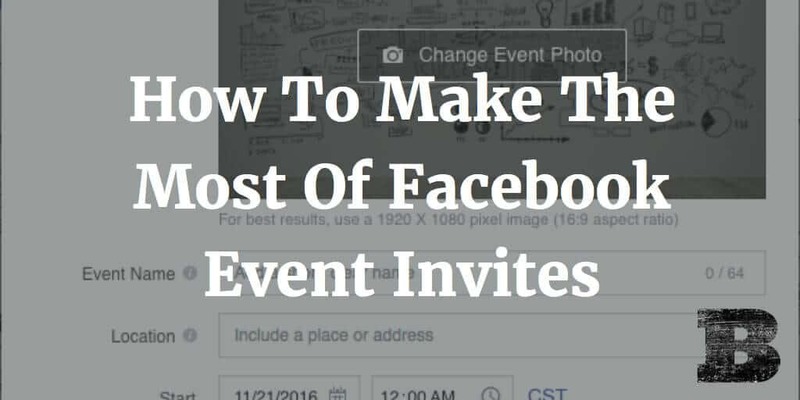 Getting the most from Facebook event invites can mean the difference between a full-house and a flop. By being strategic about how we use the powerful but limited resources that Facebook provides, marketers can make the most of their invites and garner far greater social success.